A weekend trip is a great idea to get refreshed after a long tiring week. Today’s hectic life calls for frequent breaks after every few months to de-stress yourself. A weekend trip of 2 or 3 days is the perfect way to do this. It is an ideal break whether you are travelling alone or with friends or family. Most people prefer hill stations for a weekend getaway because they offer respite from the unrelenting heat of the plains. Dalhousie is a popular destination amongst tourists for its incomparable offerings. A weekend trip is a great idea as you can enjoy most of the things to do in Dalhousie in 2-3 days. Kalatop is a beautiful wildlife sanctuary which has several trails to make it a perfect trekking expedition. So, if you enjoy trekking, then this would be a good start to your vacation in Dalhousie. You may get lucky enough to witness snowfall if you are here during the winters. You can spend an entire day here, and it is highly recommended that you carry your camera or mobile with a good quality camera to capture the fun-filled moments spent here for eternity. You can return to your hotel by evening to relax after an enjoyable but tiring day at Kalatop. Also known as the ‘mini Switzerland of India,’ this stunning place in Dalhousie is surrounded by picturesque views of forests, lakes and pastures. Enjoy the warmth of the sun while being surrounded by lush green landscapes and admire the real beauty of nature. Here you can enjoy horse riding, paragliding and zorbing too apart from street food. At the tranquil Khajjiar lake too you can indulge in some fun activities along with sight-seeing. 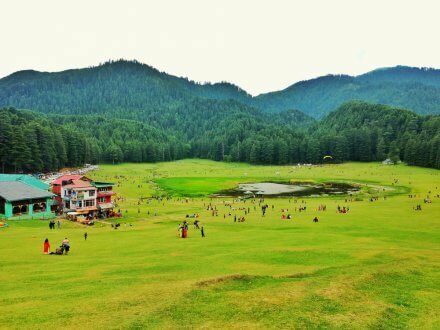 The forest trail of Khajjiar provides a distinctive experience to its visitors. Day 2 ends with a fantastic outing at Kajjiar with its astounding views. The serene waterfall at Panchpulla will steal your heart with its awe-inspiring views. The breathtaking water streams here are the epitome of nature’s gift to mankind. 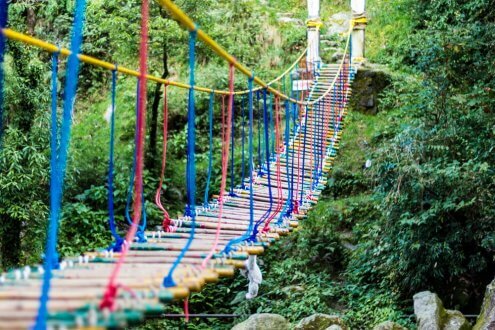 You will enjoy the untouched beauty of nature at this popular tourist spot. Don’t forget to explore the local market here to pick up some souvenirs and handcrafted products by the skilled artisans. Shop till you drop, for a perfect day at Panchpulla. When you leave Dalhousie after your enjoyable weekend here, you will have some wonderful memories to last you a lifetime. However, if you are travelling during winters, carry some extra woollens in case of emergency. Dalhousie is a wonderful destination which is popular among all types of travellers including trekkers, backpackers, etc. To make your trip memorable, you need to book the appropriate accommodation. The accommodation you choose plays a vital part in making your vacation extraordinary. 3-star hotels are generally the most preferred accommodation option for their amenities at pocket-friendly pricing. Most 3-star hotels in Dalhousie offer a comfortable stay to their esteemed customers with facilities like mesmerizing balcony views, cordial staff, a well-appointed reception, Wi-Fi, gym, bar, coffee shop, in-house restaurant and other prominent features to make your stay a wonderful experience. Snow Valley Resort Dalhousie, JK Clarks Exotica Dalhousie, Hotel Dalhousie Grand, Hotel Bombay Palace Dalhousie and Hotel Guncha Siddhartha Dalhousie are some of the popular 3-star hotels in Dalhousie that offer the best of services at affordable prices. Gandhi Chowk, The Mall, Church Baloon, GPO Square Khajjiar, Subhash Chowk, Panjpulla, Lovers Lane, Banikhet, Bakrota Hills, Club Road and Bus stand are some of the prime locations where you can find a suitable 3-star hotel within your budget. Find a hotel which is conveniently located in the vicinity of the tourist places you desire to visit. Compare the various amenities offered by the hotel and the tariff on websites like cleartrip.com to get the best deals. Go through traveller’s ratings and comments to understand the experience of previous guests at a particular hotel. Before confirming your bookings, always check for additional discounts and cash backs. Websites like cleartrip.com have some great offers for their customers. It is always recommended to book your accommodation at least 3 months in advance to grab the best deals and have a hassle-free booking process. If you are planning to visit Dalhousie during the peak season, you should make advance booking to avoid any last-minute hassles. Cleartrip.com also facilitates train/flight bookings along with your hotel bookings. It is a one-stop solution for all your booking needs. What are you waiting for? Plan your most awaited trip to Dalhousie now!